Again it was a while since I posted something here. I just wanted to write a quick update on what I’ve been up to lately. I am working very hard on Lisa/S and SuperbitRF. The goal of the project is to develop the smallest and lightest possible UAV controller system without compromising functionality. 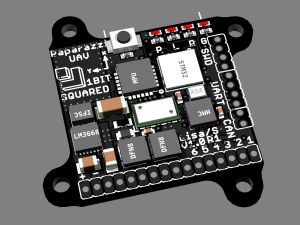 The Lisa/S board is only 20mm x 20mm and weighs about 3g with a lot of integrated sensors. Just like Lisa/M it’s bigger sister. Lisa/S is powered by the STM32F103 ARM 32bit microcontroller. Providing quite a lot of processing power for your UAV needs. On top of it all the board has 4 MOSFET solid state switches. They make it possible to use the board directly on the tiny brushed motor quadcopters, nano helicopters and fixed wing airplanes. I am quite excited how much I managed to put onto that tiny footprint. Usually much bigger boards don’t even include a GPS receiver on the board. Another feature of Lisa/S that I think is worth mentioning is that it has a CYRF footprint. CYRF is a module that I developed as part of the system. It contains the CYRF6936 2.5GHz transceiver chip. It is connected to the MCU on Lisa/S through SPI. The particular transceiver is the one at the heart of all the Spektrum transmitter and receiver systems and many others like Walkera Devo. It is very exciting because we have direct access to that chip from the autopilot and can implement compatibility to a lot of 2.4GHz RC gear available out there. Our current software implements support for some Spektrum RC transmitters and as a bonus we can simultaneously connect to a laptop using the USBRF dongle. This removes the need for having two radios on your vehicle thus saving weight. All of these items are currently available for pre-order in the 1 BIT SQUARED shop. We are working on finalizing the production process of the first batch of Lisa/S, CYRF and USBRF. We are projecting they will be available in the shop by the end of May. We have put a lot of effort into making these boards, if you are interested you can read more about it in the 1 BIT SQUARED blog. Last but not least 1 BIT SQUARED is my own company that I founded early last year. I want to develop and produce hardware and software that I am excited about and would like to share with others that are interested in the field of airborne robotics. If you like open hardware and software and want to support me directly the shop is the most direct and easiest way to do so. This entry was posted in Projects and tagged 1bitsquared, Autopilot, development, Drone, hardware, Lisa/S, multicopter, paparazzi, quadcopter, Superbitrf, UAS, UAV on April 30, 2014 by esden.